Almost Lake Front! Charming cabin 50 from Lake! With 3 bedrooms and 2 baths plus a loft, this cozy cabin is the perfect size for families or small groups. Warm and inviting living room to watch TV or curl up in a chair. The kitchen/dining area offers one large open space to allow for time spent together cooking and eating. There is one bedroom on the main floor with twin bunk beds. The master bedroom is downstairs with a king bed and twin bunk beds and upstairs in the loft is a Double and a single. bedroom 2 has a Queen bed. Remodeled kitchen and bath. Cable TV/VCR, dishwasher, microwave, central heat and a/c and gas fireplace. Deck with lake views. SATURDAY - SATURDAY rental. Max occupancy 11. Boat slip on Pier Group. 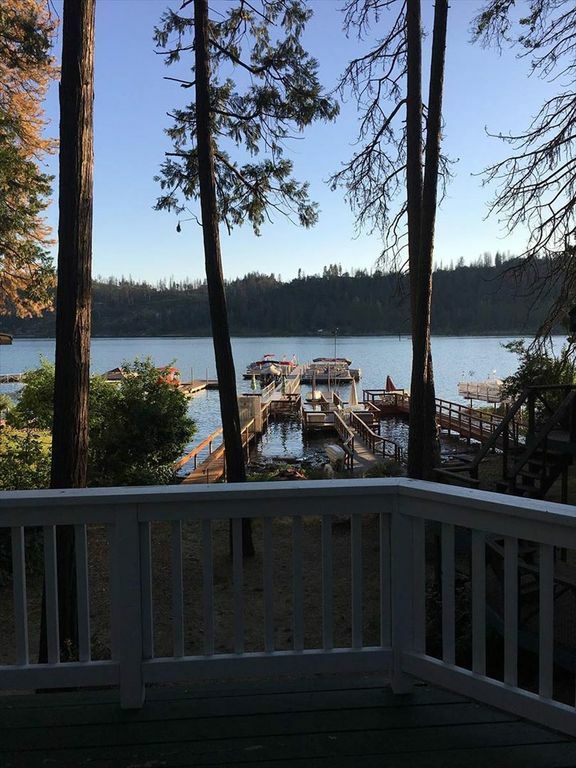 Experience the serenity of this beautiful wooded setting with its fabulous lake views! House is in a great location with plenty of bed spots for everyone to sleep. In addition, the kitchen is well stocked with cooking supplies. The home was overall nice and suitable for our group. The lake view and access is beautiful and convenient. The rooms were a bit funny, with sleeping space for 6 people all entering through one bedroom door. The bunk bed seemed very unstable and we did not feel comfortable using the top bunk. The linen package includes only top sheets and the comforters and blankets were dirty with stains and dried fluids. The property management company (Bass Lakes Rentals) was very difficult to communicate with, often unresponsive for multiple days to emails, and provided incorrect information that they then corrected multiple weeks later multiple times. The property is beautiful and functional, but I would only recommend this if you can bring your own linens and have time to contact the property management companies multiple times before and potentially following your stay. Deposit Required and Departure Clean Fee.